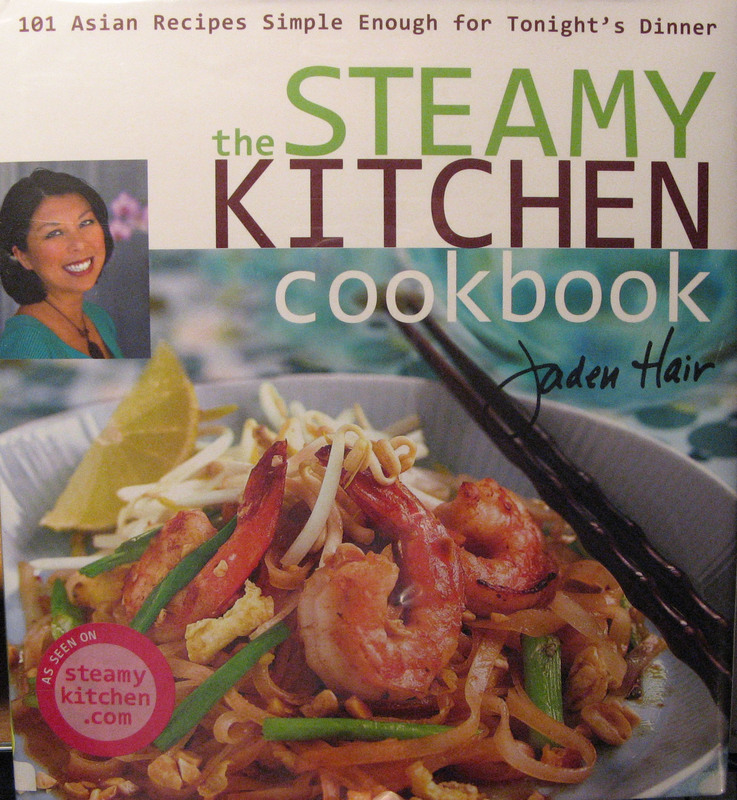 The Steamy Kitchen Cookbook by Jaden Hair is a beautiful and inspiring new Asian cookbook. Subtitled "101 Asian Recipes Simple Enough for Tonight's Dinner", the book is a take-off from Hair's popular blog Steamy Kitchen. The book is filled with gorgeous photos (taken by Hair herself), and is pleasantly laid out. After the initial section on the "Basics" (such as dipping sauces and stocks) as well as a discussion and description of basic Asian ingredients, the eight chapters which follow include Appetizers & Little Bites, Soups, Salads & Wraps, Seafood, Meat, Chicken, Vegetables, Tofu & Eggs, Rice & Noodles, and Sweets & Libations. Using Hair's easy-to-follow instructions and photographs you can make all your favorite Asian dishes at home: Lettuce Cup Appetizers, Crisy Eggrolls, Pork & Mango Potstickers, Crab and Pork Wonton Noodle Soup, Miso Ramen, Thai Beef Salad Wraps, Asian Crab Cakes, Beef Satay, Sweet and Sour Lychee Meatballs, Sweet and Sour Chicken, Asparagus and Crab with a Light Ginger Sauce, Simple Baby Bok Choy and Snow Peas, Coconut Rice, Shrimp Pad Thai, Grilled Pineapple and Bubble Tea. I chose to try the Vietnamese Summer Rolls and the Simple Ginger and Green Onion Fried Rice. Both recipes turned out well. I did have to obtain the rice paper from an Asian market, but otherwise all the ingredients were easy to come by at my supermarket. 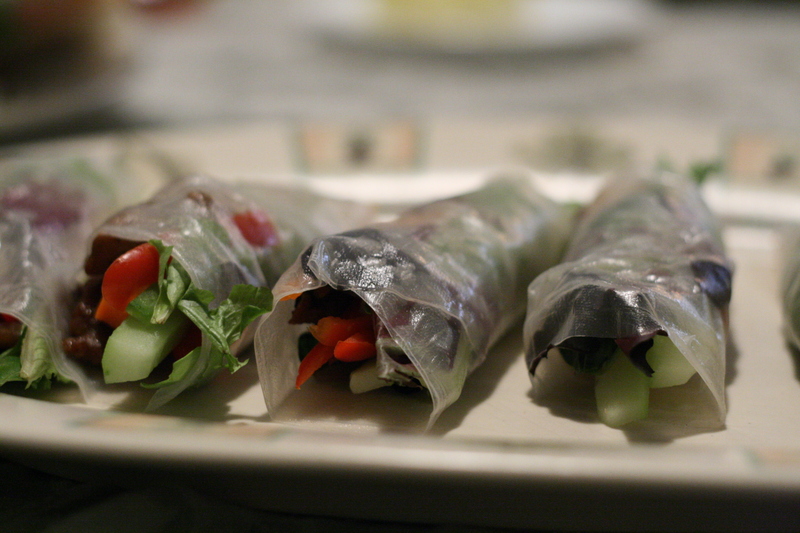 The Summer Rolls were light and fresh as well as visually appealing. To prepare the Lemongrass Pork: Slice the pork as thin as you possibly can. To make it easier to slice, place the pork in the freezer for 15 minutes to firm up. In a bowl, combine the sliced pork with the rest of the ingredients and marinate for 15 minutes at room temperature or overnight in the refrigerator. In the meantime, prepared the vegetables and herbs for the rolls. Heat a wok or frying pan until very hot. Add the marinated pork slices in a single layer. You may have to do this in a couple of batches. Fry for 1 to 2 minutes on each side, depending on how thin you've sliced your meat. Have the cooked Lemongrass Pork, rice paper wrappers, vegetables and herbs read on your work surface to roll, or arrange the ingredients on your dinner table and have everyone roll their own summer rolls. Fill a pie tin with warm (not hot!) water. Dip the edge of a rice paper in the water and quickly use both hands to turn the rice paper so that each side can dip in the water for 2 seconds. Lay the still-stiff rice paper on a clean, dry surface. Fold the rice paper in half. The paper should be pliable and may still be a bit stiff. If the rice paper is floppy, soggy and too slippery, try using cooler water or dipping the paper in the water for a shorter amount of time. 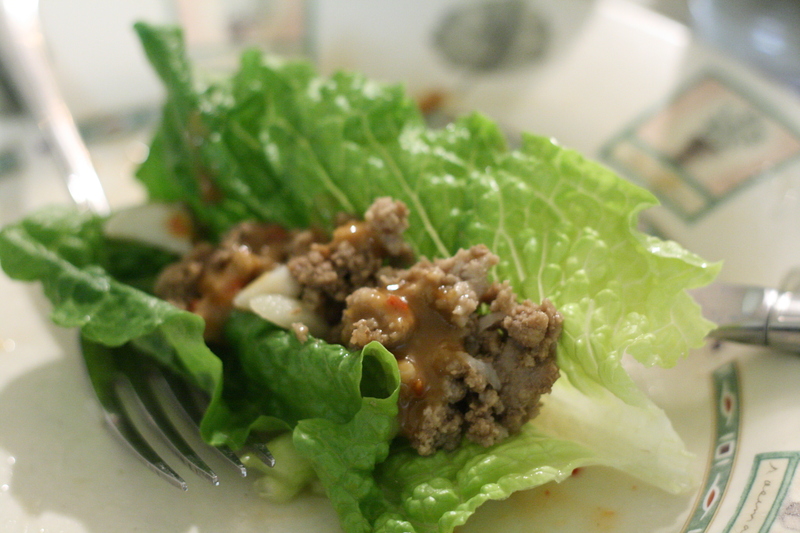 On the bottom half, lay your lettuce first to create a bed for the vegetables and juicy meat. Layer on your vegetables, meat and herbs. Do not overstuff! Each roll should have only 1 to 2 pieces of meat. If you are too greedy and put too much filling in the roll, they will be difficult to roll up! Starting from the bottom, roll up. Tuck the ingredients in as you get that first turn to create a tighter roll. Don't suffocate the poor ingredients, but do make it nice and snug. Continue rolling and you can make a slight tug back on the roll to make tighter. If your work surface is dry, tugging will be easy. Wipe your work surface dry before rolling your next roll. In a small saucepan over medium-low heat, add the oil and, when just starting to get hot, add the garlic and cook until lightly browned, about 30 seconds. Add the hoisin sauce, sugar, chilli garlic sauce, cashew nut butter and half of the water, stir well and simmer for 30 seconds. Whisk in the rest of the water if you want a thinner consistency. Keeps in the refrigerator for up to 1 week. If sauce is too thick after storing, whisk in a bit of water to thin it out. Heat the oil in a small saucepan over medium-low heat. When the oil is just starting to get hot, add the garlic and ginger and fry for 30 seconds until fragrant. Add the sweet chilli sauce, hoisin sauce, water and peanut butter and stir until smooth. Simmer until thickened. Let cool. Keeps in the refrigerator for up to 1 week. If the sauce is too thick after storing, whisk in a bit of water to thin it out. 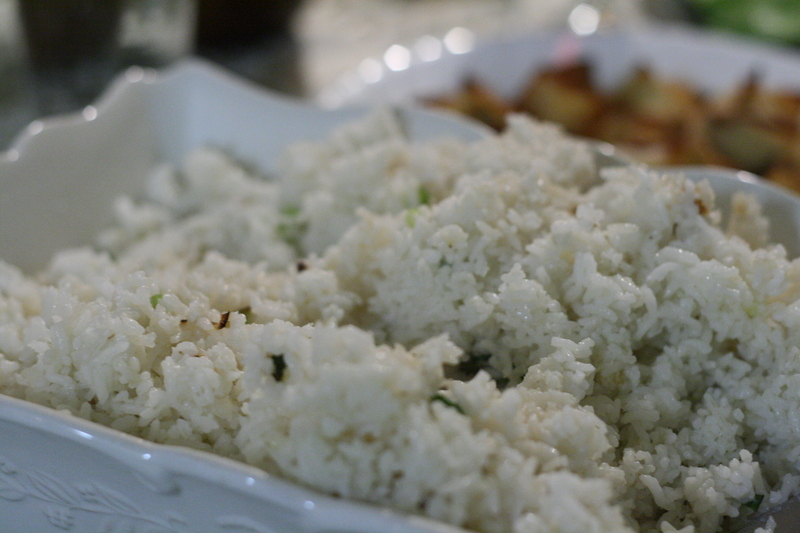 Gently separate the rice grains with a fork, taking care not to smush the delicate grains. Set a work or large saute pan over medium-high heat and add the oil. When the oil is just starting to get hot, add the green onions and ginger. Let cook until fragrant, about 30 seconds. Turn the heat to high and immediately add the rice. Stir well to incorporate the green onion mixture throughout the rice. Spread the rice all around the wok surface area and let the rice heat up, untouched, until you hear the bottoms of the grains sizzle. Use the spatula to toss the rice, again spreading the rice out over the surface of the wok and let cook for 1 minute. Add the wine, soy sauce and pepper and toss well. Repeat the tossing, spreading, and 1-minute frying until each and every grain of rice is heated through. My dad sometimes make a peanut sauce to go with chicken satay. He uses just peanut butter (his absolute favourite thing to buy/eat/cook with!!) and it's wonderful but I really should try this as well. Thanks!